Dog Days is THE family feel good movie of the summer and is a must-see for anyone who loves those four-legged furry animals. Every once in a while, there is a movie that just hits home with every target audience. 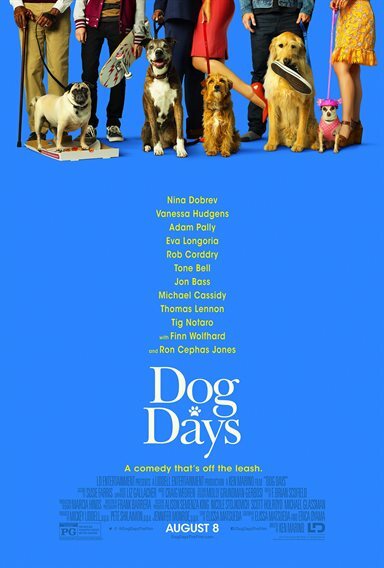 This summer it is Dogs Days, starring Nina Dobrev (The Vampire Diaries), Vanessa Hudgens (High School Musical), Adam Pally (The Mindy Project), Eva Longoria (Desperate Housewives), Finn Wolfhard (Stranger Things), and Jon Bass (Baywatch). With no overall complex plot, Dog Days instead shows a "day-in-the-life" of humans with their furry companions and how both deal with day to day situations. Throughout the film, we are introduced to a few pet owners and their lives while living in Los Angeles. Their connection… their dogs. Dogs have the ability to teach us, unconditional love, not only from them but for them and throughout all of these different lives the characters lead, they all have come to know the love and joy that only their dogs could provide. Elizabeth (Nina Dobrev) does the newscasts alone until a brash ex-athlete, Jimmy (Tone Bell; The Flash) calls her out on not being spontaneous and real. Their dogs, however, connect really well. Grace (Eva Longoria) and her husband (Rob Corddry; Hot Tub Time Machine) have adopted Amelia (Elizabeth Caro) and want to be a family. They have tried their best to provide everything a little girl could ask for but are met with stoicism at every turn. Enter a dog and the tide turns to joy. Dax (Adam Pally), good-natured and a mess up at most things except his music, suddenly finds himself saddled with Charlie, his sister's dog. She's about to have babies and Dax owes her. He's not allowed to have animals where he lives and must avoid being found out. The result is comical, and Dax learns to live with Charlie's antics. Along with all this is the good-looking self-absorbed veterinarian, Dr. Mike (Ryan Hanse; Veronica Mars); Tara (Vanessa Hudgens) the coffee shop waitress longing to make a mark in the world and Garrett (John Bass) the dog rescue owner who pines for what he believes he can't have. We have real people in real situations. You know them, you've been them. Director Ken Marino (How to be a Latin Lover) hits one out of the park here. LD Entertainment known for Forever My Girl, Jackie, Megan Leavey and the Zookeeper's Wife has brought together an ensemble cast not just of two-legged actors but four-legged as well. The interaction of all of them makes you believe in unconditional love. What's more, you want some of it for yourself. The high point of the film is when all these worlds basically collide at the end and of the culmination of dog lovers trying to raise awareness and funds to rescue dogs. Dog Days is THE family feel good movie of the summer and is a must-see for anyone who loves those four-legged furry animals. Download Dog Days from the iTunes Store in Digial HD. For more information about Dog Days visit the FlickDirect Movie Database.